Packed into the stylish, compact chassis of the CD Transport is a high quality toroidal power transformer. The transformer has two entirely separate secondary windings with one dedicated to feeding the digital electronics and the other supplying a completely separate feed to the current hungry motors. Partnered with a DAC X+ or DAC XP+ the CD Transport will deliver ruler-flat linear performance across the sonic spectrum, vanishingly low background noise and class leading jitter rejection, out-performing most integrated CD players. This is the ideal partner to our DAC equipped streaming and integrated amplifiers. 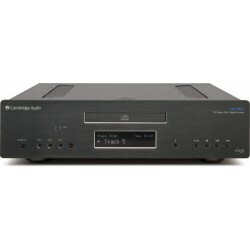 A natural upgrade path for the CD Transport owner is to return the player to our factory for upgrade to the CDXT SE2. This provides an even more advanced power supply and the option to add a PSX-R for the ultimate CD transport solution. The unique MC-BUS connectivity of the CD Transport is in keeping with the total system approach of the Cyrus range of products. This facility allows the CD Transport to “talk” to other Cyrus units in the system, enabling the system to anticipate your needs, making a Cyrus system simple to use. The quality lightweight die-cast enclosure of the CD Transport has a myriad of advantages both electrically and mechanically. The non-resonant nature of the alloy minimises microphonic effects, while its non-ferrous composition provides an effective shield from external electro-magnetic disturbances. It also helps protect the sensitive audio circuitry from any stray magnetic fields coming from the power transformer.